An atlas old English PARISHES for the general user, local historians and genealogists. 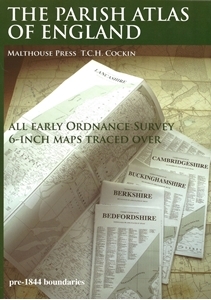 Using desktop publishing and high capacity memory personal computers the 19th Century Ordnance Survey 6-Inch County series maps have been traced over at 16.8mm (0.6619 inch) to 1 mile with readable text, combined with information from tithe maps and other sources. This is seven-year, solo, labour of love project by T.C.H. Cockin contains all 39 counties of England, with consideration to the possibility panels can make wall charts or fold-outs for separate publication.